In this issue of Belarus Civil Society Digest: demands for a special amnesty on the occasion of the ice hockey championship, training for social activists, competition for bike-friendly companies, discussions of Belarus investment possibilities and transparency of university budgets. The digest also covers several recent cultural initiatives, including Museum Fair, festivals of Hrusauka and of Belarusian advertising and communication. Appeal for special amnesty on IHWC occasion. On the occasion of the Ice Hockey World Championship, the human rights organisation Libereco – Partnership for Human Rights demands a special amnesty from Belarusian president Lukashenka for the release of all political prisoners. Another appeal has been launched by representatives of international and national human rights organisations which call the concerned States to refrain from sending official government delegations to participate in the events related to the Championship. One more statement named Belarus Must Play Fair, in Sports and Beyond calls on Belarus' leaders and citizens to take decisive steps towards making Belarus an open and democratic country. Memorandum of Partnership Alliance signed. On April 23, in Minsk, six CSOs signed a Memorandum of Partnership "Alliance" – the initiative Europerspectiva, Institute of History and Culture, Lastovsky History Society, International Association of Environmentalists, the initiative Sober Life, analytical project Belarus Security Blog. The mission of the new coalition is to increase public control over the decision-making and implementation processes at the state level, to achieve real changes in the Belarusian society, etc. Contest of small deeds Let's Make it Better 2014. The Assembly of pro-Democratic NGOs continues its campaign Let's Make it Better! and announces a new contest of positive ideas. Any CSO which is a member of the Assembly is invited to participate in the campaign aimed at revitalization of society through involvement of citizens in solving local issues. The application deadline is June 15. Internet for activists. Basics Manual. The Assembly of pro-Democratic NGOs prepared a second edition of the manual, which aims to help civil society activists to find their way in the world of modern technology and adapt it to their needs. The manual is help CSOs to talk about their activities for a wide range of people, promptly inform and educate the public about important issues and offer solutions, find new activists, etc. The book is available in various formats. SocStarter training program launches its 2nd season. From May till July 2014, the 2nd season of SocStarter offers 10 social initiatives the chance to get a full training with the goal to enable to start their own social enterprise. SocStarter is an International Social Entrepreneurship Training Program organized by SocialWeekend.by, Maesens.by, Bel.Biz, UNESCO Clubs. The program invites to the participation teams (from two people) who want to implement social business in Belarus. Panel on investment possibilities in Belarus. On April 22, in Minsk, analytical community Liberal Club organized a panel discussion Is it possible to do business in Belarus? The discussion raised such issues as success factors for foreign and Belarusian investors, the examples of business projects developing in Belarus despite or because of ambiguous investment reputation of the country, etc. Among the speakers were Pavel Daneiko, the Belarusian Economic Research and Education Center (BEROC), Mikhail Borozdin, Investment Consulting Company, Daniel Krutzinna, International consulting company Civitta. International conference on protection of children. On April 23-24, Minsk hosted the 5th International Conference Safe Belarus and CIS Region for Children. The results achieved in the countries of the Commonwealth of Independent States were thoroughly discussed as well as practical recommendations in the field of law, treatment, training and education were worked out. Master-classes and presentations of the speakers answered the question HOW to PROTECT children and PREVENT child abuse. The organizer of the Conference is the International Ponimanie NGO. Discussion on transparent budgets of universities. On April 24, at the Minsk Gallery Ў, Analytical Laboratory of Development Center of Student Initiatives held a discussion titled as of Making transparent budgets of Belarusian universities!During the discussion, a new campaign of student organizations on transparency Belarusian universities was presented. 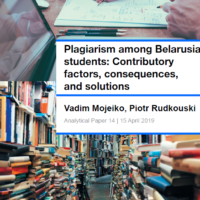 The discussion was attended by representatives of the research project BIPART, public Bologna Committee, Association of Belarusian Students (ZBS), Studentskaya Rada/ Student Council. Local Hrushauka Festival took place on May 1, in Minsk. The Festival became the first ever local community collaboration in one of the Minsk districts. The event was initiated by a private person and facilitated by a crowd-funding platform Talaka.by. Hand in hand with inhabitants of the district the Festival was joined by some organized groups – Youth union Falanster, CPM independent project, Center for Environmental Solutions and some others. The Festival had a big rotation of people to come and to leave according to varied day-long programme and gathered up to 1000 visitors. Art-Siadziba says goodbye to the premises with a big concert. On April 25, Art-Siadziba held a farewell concert party Solidarity with Art-Siadziba, headliner was NRM band. The concert had a charity nature – all the musicians performed for free, and the money will go to purchase of own premises. On May 1, Art-Siadziba should release its current office – the fifth one for the last two years. Meanwhile, the total amount of funds raised on the new office already exceeds $7,100 out of 200 thousand dollars needed. Museum Fair. 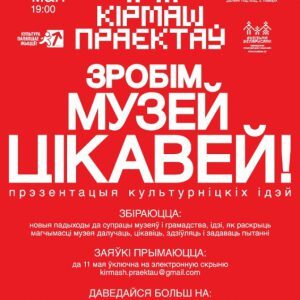 On May 15, the cultural campaign Budzma conducts Museum Fair dedicated to new, relevant ways to expand the audience of museums and modern models of working with visitors. Special attention will be given to projects that not only stimulate scientific and educational activities of the museum, but also take into account the needs of today's Belarusian society. Both professionals and amateurs are invited to participate. Professionals in the museum field will assess the project ideas. Eurasian Integration: Does Lukashenka Have a Choice? Aliaksandr Lukashenka expressed his resentment over exemptions and restrictions in the Eurasian Economic Union treaty during a meeting with a chairman of the upper chamber of the Russian parliament on 5 May. However, Lukashenka had effectively no other choice as to agree on the creation of this economic bloc a week earlier, because the Belarusian economy heavily depends on Russia and the benevolence of its leadership. In the short-term, Eurasian integration and associated benefits of good relations with Russia will help to resolve Belarus' economic problems, such as a high current account deficit and low international reserves. In the long-term, however, it creates risks for Belarusian independence and its overall development. It condemns Belarus to stagnation and second-rate modernisation in the likely scenario that Russia's conflict with the EU and the US will continue for some time. A commitment to EU integration can be more beneficial, but the government must adopt large-scale structural reforms to follow this path. Leaders of the new union aim to establish a common market of 170m people based on four freedoms – the freedom of movement of persons, goods, services and capital. Armenia and Kyrgyzstan also plan to join in 2014. At the moment, though, the union is undermined by a major exemption from the single market rules. Integrators postponed creation of the single electrical energy market to 2019 and the single financial and oil and gas markets to 2025. For Belarus, that means uncertainty over functioning of its major assets – oil refineries and transfer of Russian oil, gas and petroleum products to the EU. Therefore, the Belarusian president signed the Eurasian Economic Union Treaty unwillingly, bitterly opposing the exemptions. To sweeten the pill, Russia offered Lukashenka a $2bn loan and the Russian state-owned bank VTB agreed to issue a $1bn bridge loan that is supposed to reach the state's coffers in the following 14 days. Besides, Russia signed a firm agreement on the amount of Russian oil supplies to Belarus (23m tonnes in 2015 and 24m tonnes from 2016 to 2024) which can be increased if Belarus creates new oil refineries. In addition, Russia allowed Belarus to keep $1.5bn of Russian oil export duties in its state budget in 2015. The sides agreed on a further step-by-step reduction in the amount of duties due to be repaid to the Russian budget, with the prospect of keeping the full amount of $3.3-4 bln at home earlier than 2025. Nevertheless, Russia wants to keep the Belarusian leadership on a short leash and exercise leverage over its reluctant partner, so this issue remains within the framework of bilateral relations. While some commentators and members of the general public believed that Lukashenka was genuinely willing to frustrate the integration talks with Russia and Kazakhstan, he could hardly do so. The reason for a relatively fast acceptance of integration on Russian terms lies in the high level of dependence of the Belarusian economy on Russia. Close ties with Russia serve as the main pillar of Lukashenka’s socio-economic model, with the total amount of Russian support in subsidies estimated at 15-16% of the Belarusian GDP. The Belarusian economy is currently experiencing significant problems, including a high current account deficit, low international reserves and a troublesome situation in the foreign exchange market. 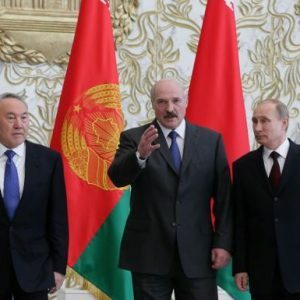 If Lukashenka abstains from the Eurasian integration project, Russia can quickly change its stance towards Belarus and make it comparable to the Ukrainian one, making harsh demands that would be unbearable for the weak Belarusian economy. That is the last thing the Belarusian ruler wants ahead of the upcoming presidential election. Some Belarusian opposition parties, such as the Belarusian National Front or the Belarusian Christian Democracy, have criticised the Eurasian Union agreements, saying that they bind the country even closer to Russia. However, a strong opposition to this integration process does not exist in Belarusian society as the majority depends on the state and its paternalism. Such opposition also does not make great sense for the economy, which remains unreformed and can quickly experience a currency crisis similar to what happened in 2011 if relations with Russia worsen. To disappointment of EU advocates in the country, the demand for redistribution of rents instead of reforms remains very high among the establishment and the population alike. However, some other aspects of Eurasian integration may encourage the Belarusian leadership to change the country’s development model. Vladimir Putin is building the Eurasian Economic Union with a clear political agenda, even though his counterparts have yet to admit it publicly. As he said in his Crimea accession speech, he wants to build and strengthen the "Russian World". This idea is clearly hostile to independence of Belarus as a country where 70.2% of the population speaks Russian in their everyday life, according to a 2009 census. Russia dominates the Eurasian Union and will not hesitate to exercise its leverage to ensure its interests in Belarus, including the privatisation of the most attractive assets in favour of Russian businessmen. The redistribution of oil and gas rents serves as a locomotive for integration between authoritarian leaders. They remain reluctant to take any decisive steps to put an end to their overreliance on oil revenues at the expense of their respective manufacturing sectors. Though Belarus has a higher share of manufacturing in its GDP (25% as compared to 15% of Russia and 12% of Kazakhstan) and a lower share of fuel in its merchandise exports (38% as compared to 71% of Russia and Kazakhstan), the sustainability of the country’s economy still largely depends on preferential oil agreements with Russia. In addition, if Russia continues its self-isolation from the Western world, this factor will frustrate technical modernisation and economic liberalisation. In the long-term, EU integration would appear to be a more beneficial option for Belarus because of the substantially larger size of the EU market. Technologically advanced investments from EU countries may facilitate the restructuring of the Belarusian economy and offset its current account deficit. At the moment, Belarus has the lowest foreign direct investments (FDI) stock per capita ($1,514) among all its neighbours, both in the EU and outside. A high level of state-owned property indicates that Belarus still has a large untapped potential for the attraction of FDI. A massive influx of FDI into the countries neighbouring Belarus has been made possible due to their commitment to rigid EU accession conditions that have promoted liberalisation of trade and capital flows, as Bronk (2002) argues. However, the Belarusian government must implement painful structural reforms to pursue this agenda. The period of Eurasian integration must be strategically used to prepare for a momentum of change in attitudes of EU citizens from the fatigue to an interest in further integration. The Ukrainian crisis has attracted a lot of attention to the region and opened a window of opportunity that Belarus should not miss. Otherwise, Eurasian integration may preserve the nation's Soviet-like economic model and bind the country to Russia for a very long time to come.